Hello and welcome to The Whimsy Brush! PLEASE READ ALL DETAILS LISTED BELOW. IF YOU HAVE ANY QUESTIONS PLEASE DON'T HESITATE TO MESSAGE ME. This listing is for a SEMI-CUSTOM bible design. Semi-custom means that the layout of the design and the rosette floral style shown in the listing photos stays the same. The base color and floral colors can be customized. Base bible color options are dark ink navy, black, black plum or warm gray. Lettering (verse or quote) can be also customized. PLEASE message me prior to ordering so I can verify that your verse request will fit within the design. Up to 14 words work best however the fewer the number of words the more room there is for script style lettering. Longer verses will include some print style font. **I carry KJV and ESV journaling bibles in stock. The ESV journaling bible is slightly smaller than the KJV journaling bible. **I also carry the NIV journaling bible in stock and it would also be an option for this design. Please note however that it is slightly different in that it has a stitched seam down the front and back, other wise the cover is smooth and paints nicely. This bible also only comes in what is called comfort print making this bible slightly thicker than the other in stock options. 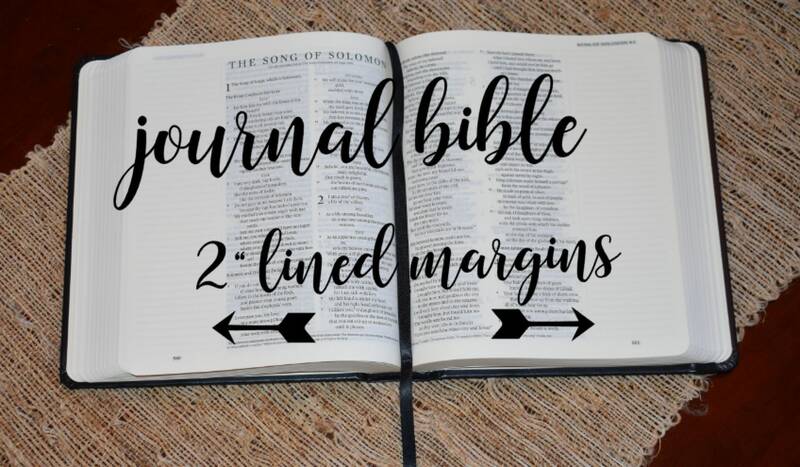 **Journaling format bibles have a 2" wide lined margin for writing and note talking on each page. If you wish to have a different version or a large print version please message me for availability and pricing. Please note that any special version requests must have a smooth hard cover to be an option for painting. Please note that any special version requests must have a smooth hard cover to be an option for painting. **Measurements can be found in the FAQ section under policies. **Now available-custom bible bags to carry and protect your hand painted bible. These bags have been custom made to fit the journaling bibles I carry in stock. Bags have extra room to accommodate a writing journal. 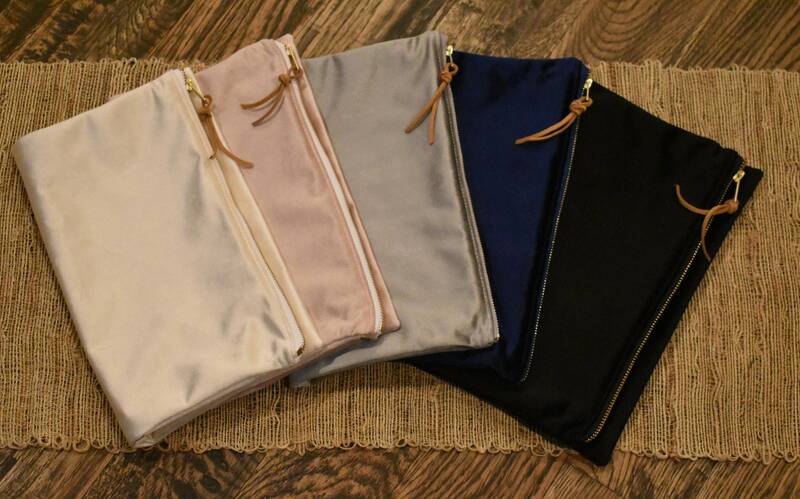 The fold over clutch style bags are available in black, navy, light gray, blush and ivory velvet. 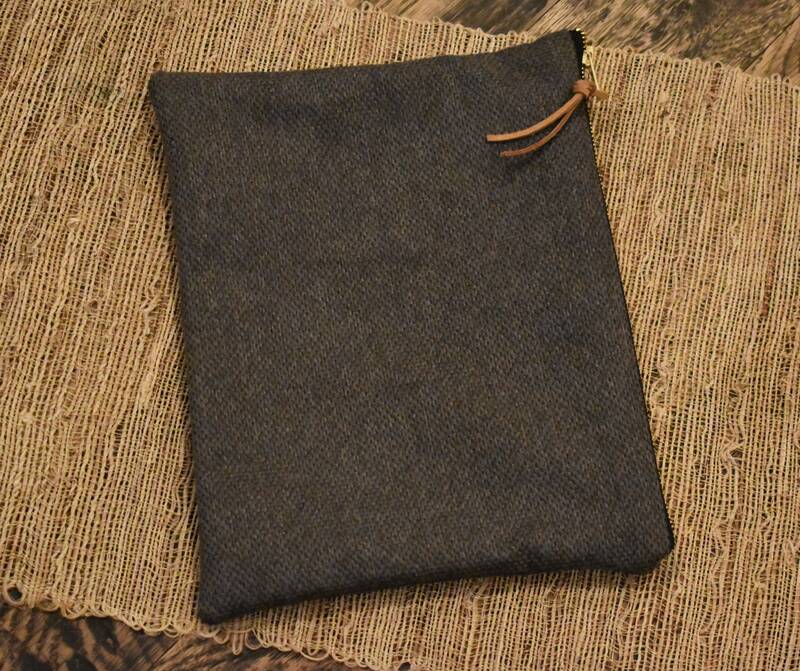 The single zipper non-fold bag is available in dark gray tweed. 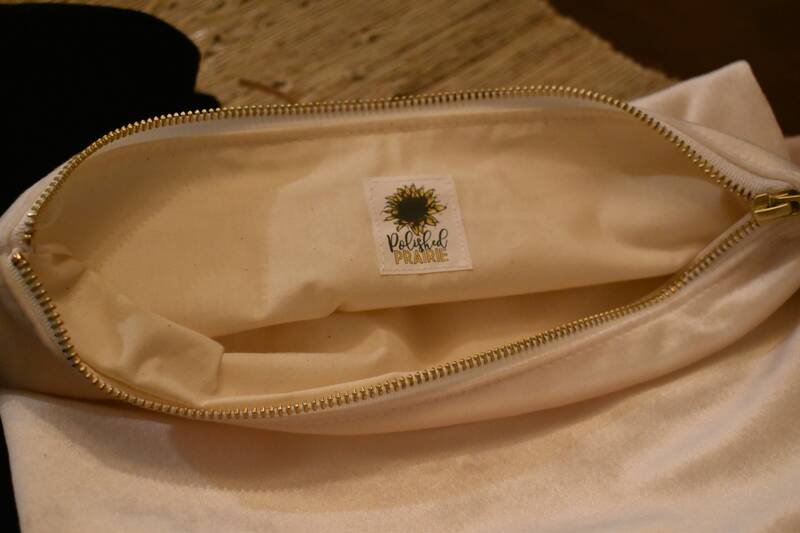 All bags are fully lined with muslin with gold zippers and leather pulls. **Please select from the drop down menu bar which bible option or bible + bag option you wish to order. BE CAREFUL WHEN SELECTING FROM THE DROP DOWN MENU BAR TO ENSURE YOU ARE GETTING EXACTLY WHAT YOU WANT. REMEMBER that 1 side means lettering on front/spine, and 2 side means lettering on all sides. BIBLES COME WITH OR WITHOUT BAG. **Bible example shown is based in black. Florals are added in shades of dark teal, coral pink, blush pink, soft peach and white. Foliage is added in shades of dark teal, soft teal blue and soft sage green. Metallic gold, metallic silver, metallic copper, metallic rose gold, light gray and white are lettering color options. Please indicate in the message box when ordering what lettering color you wish to have on this design. ** 1 SIDE OPTION-Price includes: Floral design as shown on front, spine and back. Lettering on the front and spine. 2 SIDE OPTION-Price includes: All of the above plus lettering on the back. **Front or back lettering options are first short verse or quote, name/names, last name, initials, and date. Spine options are Holy Bible, The Holy Bible, Word of God, first name, last name or initials. **HOLY BIBLE will be the default on the spine unless something different is requested. **Please note that these bibles are hand painted and intended for gentle use and keepsake purposes. Reckless use could result in damages, scratches/scuffs on the painted surface. Bibles will develop a small hairline split in the paint at the bend of the spine. This can not be prevented as paint is not intended to bend or crease. If using as a daily bible I recommend a carrying case for added protection. All lettering and florals are hand brushed and will have some visible raised strokes. This adds to the uniqueness of the hand painted/hand made item!! **Please note that all bibles are painted upon order, no returns accepted unless there is an error on my part. Florals will vary slightly in color from the listing photos as they are blended while wet. No two bibles will be exactly the same. 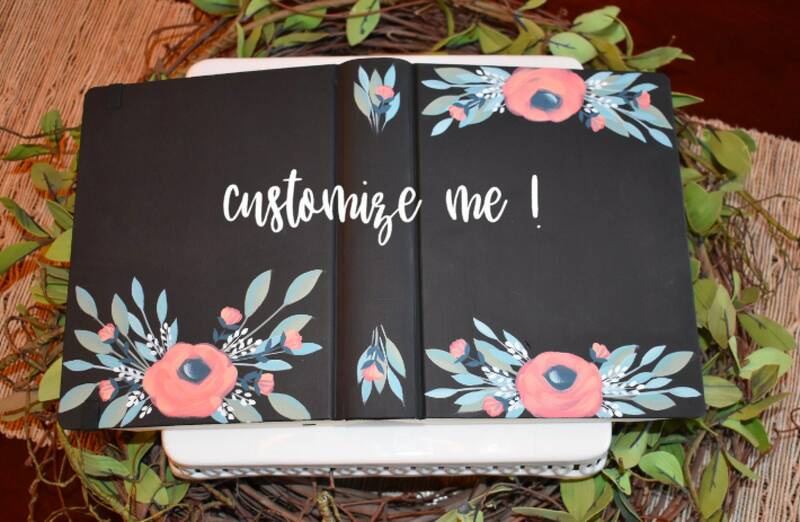 ** If a custom verse has been requested there may need to be adjustments in the placement of the leaves and florals to allow the custom verse to fit. **All bibles come with a canvas drawstring bag. Thank you for visiting The Whimsy Brush! I accept payments via credit card or Pay Pal. No checks are accepted. Due to the nature of custom orders, production will not begin until payment has been received and processed. I gladly accept custom orders, they are subject to a customization fee which is determined once final details have been discussed. This applies mostly to items that are completely different from anything in my shop. Specialized floral requests will fall under this design fee. Please be specific when ordering to ensure I am creating exactly what you have in mind!! All items are shipped USPS with tracking numbers and insurance. Priority mail packages typically arrive within 2-5 business days. Once your item is shipped you will receive an email generated through Etsy letting you know that your item is on it's way!! If you need your item by a certain date, please message me prior to placing your order to ensure I am able to complete it by the date needed. A RUSH order may be needed in some cases. A "RUSH" is when the customer is asking for a product or custom product to be sent before the estimated shipping time stated in the listing. I have limited RUSH order spots available so please message me prior to ordering. Rush orders will result in a $25 "rush" fee. **Please note that I guarantee a "ship by date" but can not guarantee what happens with USPS once the item leaves my possession. If you have any questions regarding shipping please feel free to message me. If you order a custom item and there is an error on my part, (misspelling, incorrect information, etc), I will offer to redo the item at no charge to the customer. If I feel I can fix the error on the original item I will send a prepaid shipping label to return the item to me. If I feel I can't fix the error on the original item it will be replaced. If there is a mistake by the customer on an item ordered with incorrect information given on a custom request or the wrong item ordered any correction or replacement is at the customer's expense. All items in my shop are painted custom upon order. NO refunds will be issued. *Due to the custom nature of each item a rough draft is not always possible for custom orders. My hope is that you love all of Whimsy Brush items and that you have complete faith in my ability to provide you with a custom design. Photos are always helpful if there is something exact that you are looking for in design or color. I do not guarantee custom matching of color unless a fabric or paint swatch is sent. I will do my best to match to any photo or verbal color request. *Please be sure to read all information and details given in an item description. If you have any questions at ALL please message me for further information. I want to be sure that you understand what you are ordering so that you are happy with your product. Pay careful attention when ordering bibles that you understand what is included and not included in the different options. Don't ever hesitate to message me and ask questions. It is very important to me as a business owner that you love your item when you receive it, however, it is up to you as the customer to understand the details of what you are ordering. Due to all items being custom painted upon order I do not accept returns or exchanges. *Please note that all wood signs are hand painted upon order. Due to the natural surface of the wood there may be slight differences in the way the wood takes the stain and how the wood is distressed. Knots are common in any wood and will vary from piece to piece. Florals are hand brushed and will always vary slightly from the sample photos. Repurposed wood is used whenever available. My goal is to always provide you a sign that is as close to the ones pictured in the the listing. All lettering is hand brushed and will have some visible strokes. This adds to the uniqueness of the hand painted/hand made item!! **You MUST contact me the day the damaged item is received, photos must be sent of the damaged box and the damaged item. All items are shipped with insurance and I will file the insurance claim with USPS. Once contact with me has been made and the required photos have been sent I will gladly work on replacing your item in a timely manner. If proof of shipping damage can't be made then the item will NOT be replaced. I do not offer any type of warranty on my items. If there is a problem with your item I certainly want to know about it and if possible correct the issue. *Wood signs are sealed with an indoor/outdoor product and can be placed outside on a covered porch area. I do not recommend that they be placed in direct sunlight or direct weather. *Bibles are hand painted and intended for light use and keepsake purposes. All painted bibles will develop a slight split in the paint where the spine bends when opening and closing. This can not be avoided due to the fact that paint is not intended to bend and crease. If you plan on using your custom painted bible as a daily tool I highly recommend that you use a carrying case to help prevent damage. 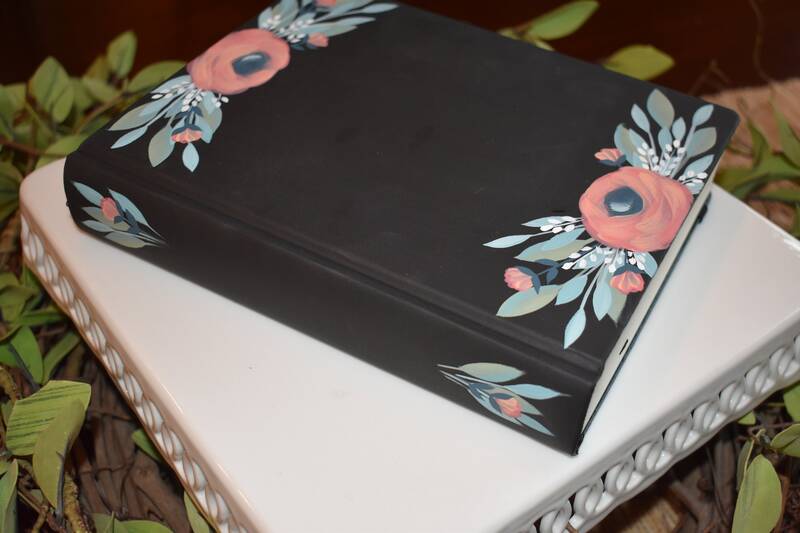 Hand painted bibles need to be treated with care and are more fragile than your typical hard cover bible. Theft: I am not responsible for any item that is stolen from the given address once the item has been marked delivered by USPS. Rush order guarantee: When a rush order is placed I will guarantee the "ship by date" with the customer. I am not responsible for delays due to issues with USPS and their shipping timeline. Sales tax is collected in states that require it. Etsy will collect the sales tax and remit all payments directly to those states. All conversations will be responded to as soon as possible. I try and close my studio on the weekends when my order schedule allows to spend time with family. If you message me on a weekend it might be Monday morning before you get a response. What Pens work best with the Bibles? I recommend Sakura Micron Pens. These pens won't bleed through the pages but due to the thin nature of Bible pages they will "shadow" onto the opposite side. What Highlighters work best with the Bibles? I recommend the Accu-Gel Highlighters for highlighting verses. These highlighters are not wet like regular highlighting pens and won't wrinkle the pages from the moisture. How well do the painted Bibles hold up? Hand-Painted Bibles are intended for light use but can have extra protective coats applied for heavier use upon request. All hand painted Bibles will develop a slight hairline split in the paint along the edge where the Bible opens and closes. This is a natural occurrence and can't be avoided on any painted Bible. I also recommend a darker base color design for heavier use. Please let me know when ordering if you wish to have extra protective coats added. This is at no extra charge. I also highly recommend a carrying case for added protection for a daily use Bible. How to clean your bible surface: For scuffs on a light colored design try using a gum eraser or magic eraser. You can also use a damp soft cloth with gentle pressure. Is there a warranty provided with a hand painted Bible? I do not provide any type of a warranty. Reason why... once the Bibles leave my shop I have no idea how they are being treated. Any painted bible will develop scratches and scuffs if not properly cared for. I do recommend using a Bible carrying case if you plan on transporting your Bible from place to place. What are my custom options? -choice of short song verse or scripture verse (either side) 3 to 14 words look best without looking crowded. PLEASE NOTE: A common topic is the apostrophe in the last name, here is the rule. *When a family name (a proper noun) is pluralized, we almost always simply add an "s." So we go to visit the Smiths, the Grants, the Grays, etc. When a family name ends in s, x, ch, sh, or z, however, we form the plural by added -es, as in the Marches, the Joneses, the Maddoxes, the Bushes, etc. Do you offer more versions than just ESV and KJV? I am happy to try and locate a different version for you upon request. 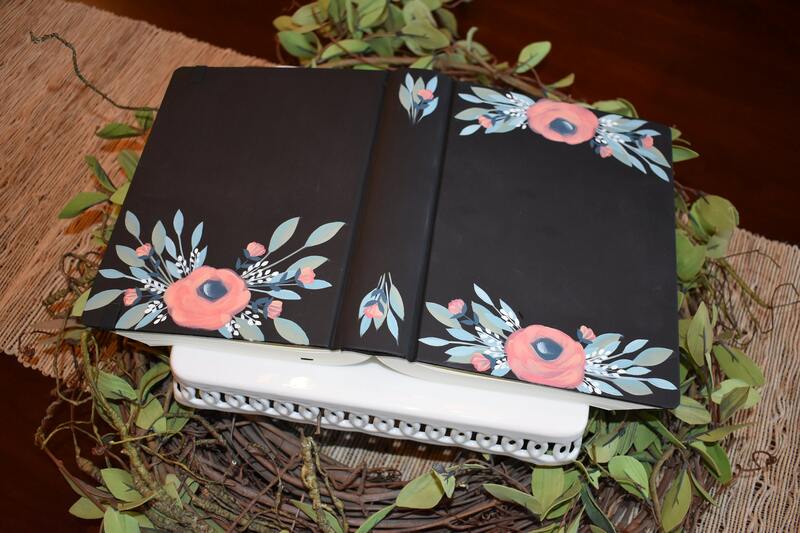 If I am able to find a hard cover that is paintable I will be happy to order one special for you. Cost could vary from the prices of my bibles that I carry in stock. **ESV (For darker base designs) Measures approx. 8.5" W x 7.5" T x 1.25" W spine. **ESV (For light base designs) Measures approx. 6.25" W x 8.25" T x 1.5" W spine. **NIV Measures approx. 6.5" W x 8.25" T x 2" W spine (NIV does have a stitched seam down both sides and only works for certain designs. It also only comes in a comfort print. How long will it take to receive my custom order? My current order load is averages a 4-6 week processing time. Do you off RUSH on custom orders? I do offer RUSH orders. Here is how it works. I am a one-person production and this is what I do full-time. Orders are scheduled Monday through Friday in the order they are received. I reserve a few RUSH order slots on the weekends that I am available to work. These slots are the only way to place a new order ahead of others. RUSH orders will have a $25 RUSH fee. If you need a RUSH order please message me prior to placing your order to ensure that I have openings available. Once confirmed I will send you a custom RUSH order link for purchase that includes the additional fee. This custom listing must be purchased within 24 hours once the link is sent. If NOT purchased within that time it will expire and you will lose your spot. Why do you only carry journaling size Bibles? **Standard size Bibles that I have found all have indented text on the front covers and it shows through the painted designs making them not ideal for design. 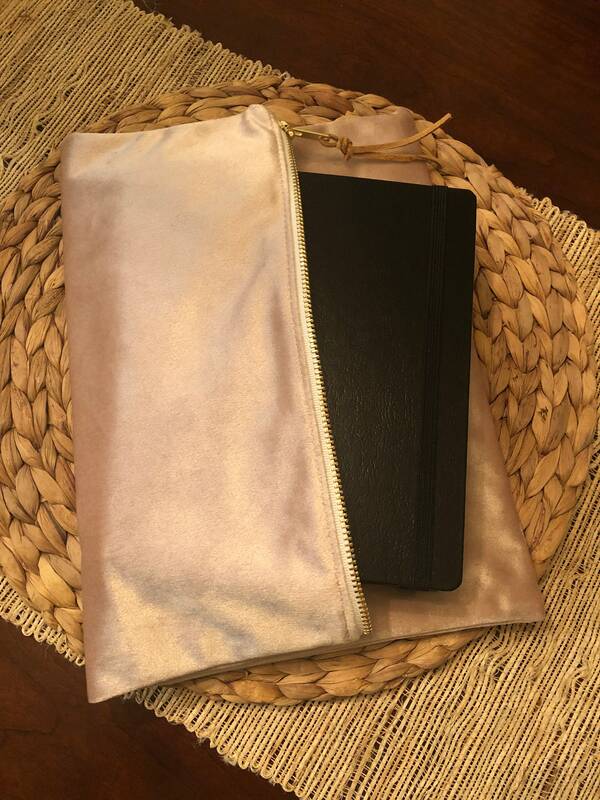 **Journaling Bibles have a smooth cover making them a nicer surface for design. The also have a 2" lined margin on the sides of each page which adds more space for writing/signing next to highlighted verses. Can I send you my personal Bible to be painted? Unfortunately, I only sell the Bibles I carry in stock, and do not accept send-in Bibles. Without knowing the type of material on the Bible I can’t trust and promote the integrity of my product. I have found from experience that certain types of Bible covers do not accept paint well. Through trial and error I have fine-tuned my process and products to make sure that the Bibles made are of good quality.